At L’Altura, we offer our guests the best line up of dishes innovated on by our talented chefs creating a fusion of the classic and the modern elements giving each dish an impression which guarantee every epicure’s enjoyment in each plate. All our dishes are prepared with a genuine passion for creating authentic and mouth-watering food at a high quality standard ensuring that only the freshest, cleanest and most delicious morsels reach your table. 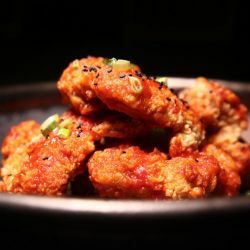 Deep fried chicken thigh tossed in sriracha sauce, drizzled with sesame oil. A fusion of Japanese and western flavors in a steaming bowl. 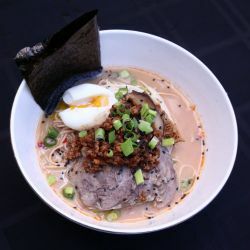 Spicy miso broth with noodles topped with pastrami, soft boiled egg and pork. Our version of the filipino’s favorite dish with Asian and Arabic influences. 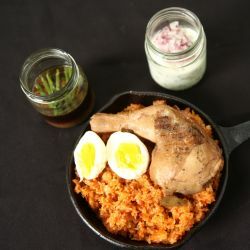 Grilled chicken adobo on mildly spicy rice and yogurt relish. Must try! 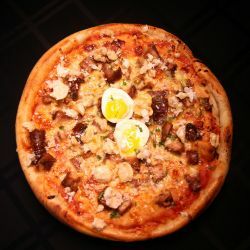 Signature dough with traditional Filipino flavors of sisig, adobo and chicharon. 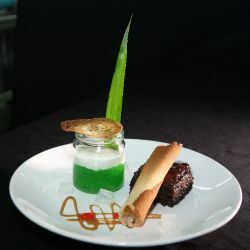 Our take on classic dessert with a contemporary flair: Buko pandan gel, Turon and champorado.